Please refer to our stock # F024 when inquiring. 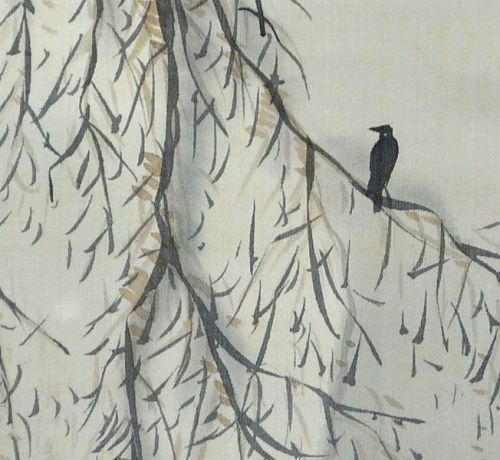 A crow stands stark against a dark landscape, the last vestiges of autumn clinging to frozen branches as the landscape settles with snow. Below water surrenders to gravity as it drops into the unseen depths. Ink and light color on silk in a green silk border patterned with tangled vines and featuring stag antler rollers. It is 19 x 76-1/2 inches (48 x 194 cm) and in overall great condition. Tanaka Raisho (1867-1940) was born in Shimane prefecture, into an important household which fell to ills after the Imperial restoration in 1867. So giving up his dreams to study in Kyoto, he became a traveling artist, painting for fees in the mountainous areas of Hiroshima and Shimane, going from village to village and sending his earnings home to help the family. With copies of the work of Mori Kansai, he was self taught; only making it to Kyoto at the age of 36. A very late start for an artist at that time. After moving to Tokyo, and despite his age, he was accepted into the circle of Kawabata Gyokusho (1842-1913) and flourished under his tutelage, garnering much acclaim at the Nihon Bijutsu Kyokai Exhibition, and Teiten/Bunten National Exhibitions. However after the great Kanto earthquake of 1923 destroyed the city, he returned to Hiroshima where he lived out his final years.